The best Chinese beef stew (柱侯蘿蔔炆牛腩) I have ever tasted was at an old school coffee shop in Aberdeen, Hong Kong. They cooked by the traditional way, nothing fancy, but did it exceptionally well. Serve with a bowl of noodles on the side, and it is heavenly. After a few months of not enjoying the beef stew, I am tempting to develop my version since I do not visit Hong Kong very often. I grew up eating Cantonese food and still prefer Cantonese food as my staple over other forms of cooking. Therefore, I am keeping the recipe as close to the traditional Cantonese style. It is relatively easy beef stew recipe. 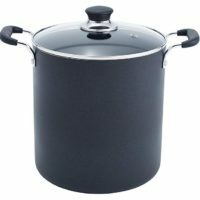 The most critical ‘technique’ is to be patient- let it stew at barely boil temperature for over two hours. Other than that, there are a few tricks which I will highlight in the following sections. 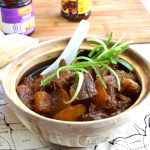 The most suitable cuts for this Chinese beef stew is the beef brisket and tendon. Both are tough but very flavorful, which is ideal for stewing. Other cuts like chuck and rump can be used, but brisket has layers of fats in between the lean meat which works best for slow cooking. Put the beef in a stock pot. Fill up a pot with cold water, enough to cover the beef. It’s important to use cold water and uncover as it is more effective to remove larger particles and impurities from the meat. Add a few pieces of ginger and half a teaspoon of white peppercorn, which helps to remove the unwanted smell, if the meat is not super fresh. Bring the water to a boil over medium to high heat, then reduce to low-medium and let it boil for about five minutes. Remove the beef once the exterior of the beef has changed color and cooked. It does not matter if the interior is still raw as we will continue stewing the meat. Wash it under running water or in a pot of cold water to remove any blood and impurities. Cut the beef brisket into chunks, about one to one and a half inches squares. The primary purpose of the pre-treatment before stewing is to remove the unwanted smell from the blood and other impurities of the beef. The ginger and peppercorn also help to get rid of the smell. Keep the beef fully submerged in cold water and heat it over medium heat. This way is very effective to remove the impurities. You can skip this step if you have a fresh piece of beef or do not mind the raw meat smell. Throw away the water after blanching the beef. You should use fresh water to stew the beef subsequently. Keep the beef in the freezer until it is half frozen. It is much easier to cut the beef in this state. Blanch the whole piece of meat. Cut it only after it cools down. It is easier to cut the partially cooked meat than raw meat. Blanching the whole piece of meat and cut it later is my preferred method. 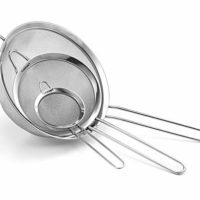 It will minimize the loss of flavor during the parboiled step. Cut away part of the fat before stewing if you find that the beef brisket is too fatty. For those who does not like there is too much oil floating on top of the beef stew, you can use the following method to remove it effectively. Stew the beef until it is nearly done. Then let it cool completely. 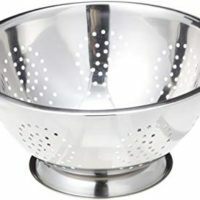 Remove the beef and the radish by either using a thong or pour through a strainer/colander. Transfer the stew liquid to the freezer until the oil floating on the surface start to solidify to form a solid layer. It may take half an hour but depends on the actual amount. Remove the solid fat and keep the stewing liquid at the bottom of the container. Transfer the liquid and the beef back into the pan then continue to stew until the beef is tender. You do need extra time to carry out this step. The beautiful part of this Cantonese style beef stew is that it gets tastier after keeping overnight. The flavor from the stew liquid will penetrate fully into the beef while keeping for a longer time. If you plan your cooking earlier, you can divide your work in two days, which will not take much time from you as it is passive cooking! The Asian beef stew involves a different set of flavoring ingredients from other cuisines. One of the indispensable ingredients in this Cantonese beef stew recipe is the Chu How sauce. You should be able to get it at most of the Asian grocery shop. If you have difficulty to describe it to the shopkeeper, show him the image on this page! If you are unable to get it, use Hoisin sauce plus a few extra cloves of garlic as the substitute. Legend has it the Chu How sauce was invented over two hundred years ago at a restaurant next to the Zumiao Temple at Foshan, Guangdong. The owner Mr. Leong was a creative chef and passionate in his work. He liked to experiment with a different concoction of sauces. 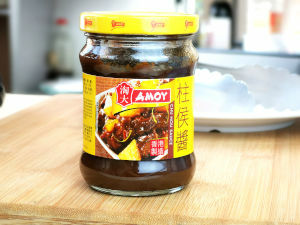 Apart from operating the restaurant, Leong also manufactured a range of sauces for the local community. One of the sauces has been sold as far as to Hong Kong and Macau. His sauces were made mainly from soybean and flour, then fermented, dried and cooked down to a paste with oil, sugar, and sesame. 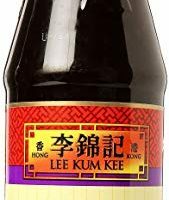 The sauce was so famous that it was named after his first name Chu How. There is a belief that stewing with rock sugar can tenderize the beef. I have not been able to verify this belief. 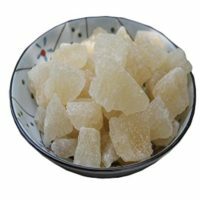 According to a study entitled “Studies on Chinese rock sugar: Analysis and taste”, there is very little difference between the proximate composition of rock and refined sugar. Taste panel tests also showed no significant difference in the sweetness and the quality of taste from those of refined sugar. The taste of rock sugar does have some differences from certain types of sugar. Rock sugar has a clean taste with no caramel tones, which is why the Chinese prefer it over brown sugar for their cuisines. Radish compliments the flavor of beef very well. The radish absorbs the flavor of stew liquid, which has loads of beef flavor. Cut the radish into wedges, about the size of the beef. Add the radish to the stew in the last forty-five minutes of cooking, since it takes a shorter time to turn soft compared to the beef. You can omit the radish or reduce the quantity as stated in the recipe. It has a slightly bitter taste and may not be the favorite for everyone. Other common seasoning ingredients are Hoisin sauce, Chinese light and dark soy sauce, and oyster sauce. As for the aromatics, ginger, garlic, and some scallions are sautéed in the wok before adding the partially cooked beef. While the first two are quite universal to other cuisines, the sun-dried tangerine peel is very specific to Chinese food. It can be challenging to get outside of Asia. Fortunately, it will not make a huge difference if you omit this item. 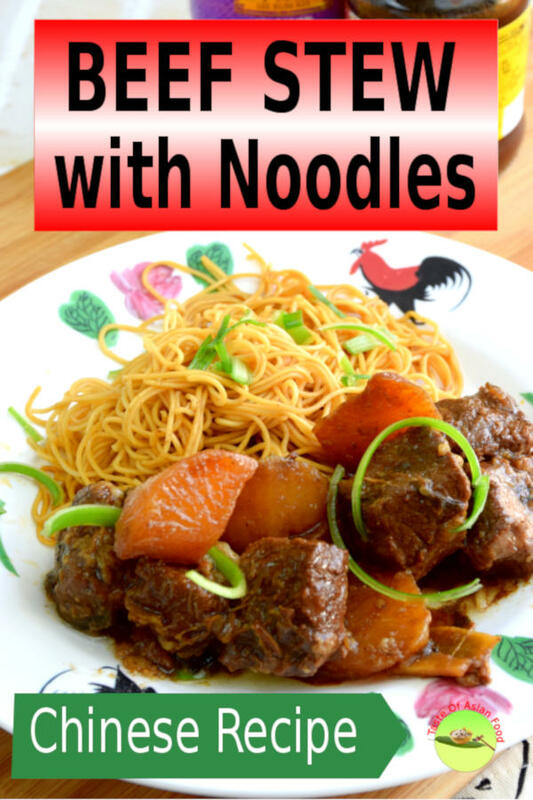 This beef stew is best to serve with rice or noodles. It can be kept for up to two weeks in the frozen state without losing noticeable flavor. I suggest you make a large batch and portion it for your convenience. The best Cantonese style beef stew 柱侯蘿蔔炆牛腩 I have ever tasted was at an old school coffee shop in Aberdeen, Hong Kong. 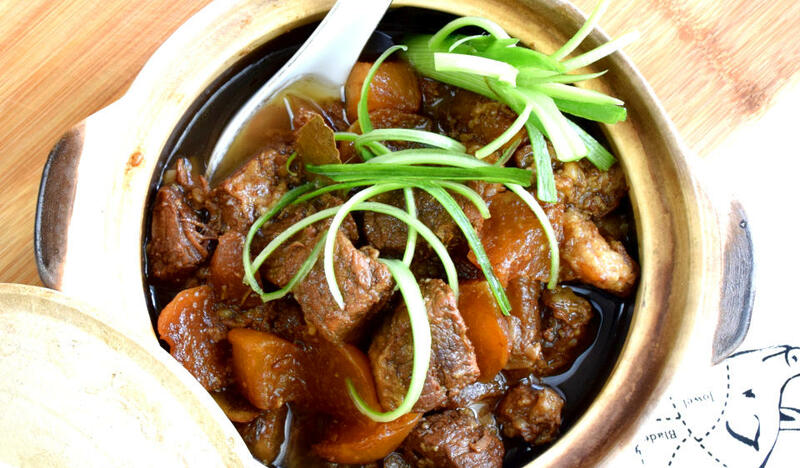 The Cantonese beef stew is best to serve with steamed rice and noodles. Place the beef, ginger, and peppercorn in cold water, enough to cover the beef. Bring the water to a boil. Let it boil for about five minutes. Remove the beef, wash and cut into chunks. Heat some vegetable oil. Saute the ginger, garlic, and scallion until aromatic. Add the blanched beef. Stir-fry for five minutes or until the beef turn slightly brown. Add the ingredients in the seasoning section. Add the dried orange peel, bay leaves, and star anise. Stew over low heat for two hours. Turn the beef occasionally to avoid sticking to the bottom of the pan. Add the cut radish. Continue cooking for 30-45 minute or until the radish becomes soft. Dish out and garnish with chopped scallion. 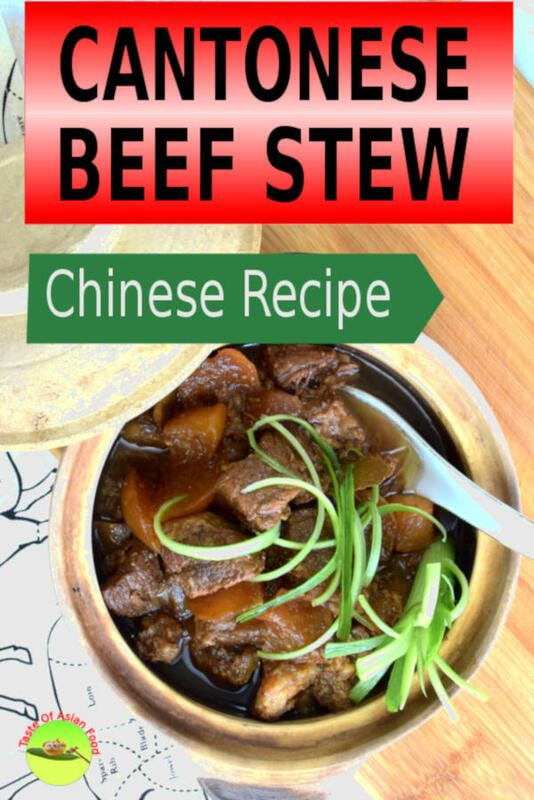 3 replies to "Chinese beef stew – How to prepare (the authentic way)"
Mr Kwan, for those not eating beef, can we replace it with pork? Thank you. I never tried to substitute with pork. My instinct tells me that I need to test the compatibility of the flavor of pork in relation to the set of other ingredients in this recipe. Please take a look at both recipes. I hope that is what you are looking for.